Developed for the Defenders of Wildlife. 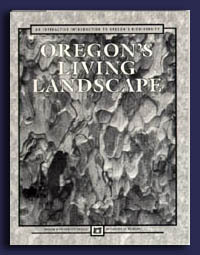 The CD-ROM contains a detailed overview of the Oregon Biodiversity Project, complete with maps and color photos. Included are data sets used in the project's analysis, information on how the data was collected and compiled, and an interactive portion demonstrating the potential applications of the data. For more information and to order, download the Order Form.